A Brief Discussion of Gratitude in a San Serif Style. posted by Beret. To the two of you who also subscribe to my personal blog, Bad Parenting 101: apologies for today’s simulcast! In honor of the upcoming holiday, I wanted to take a moment to think about gratitude. If that sentence gave you the heebie jeebies, join the club. For some unknown reason, I have a deep-seated repulsion for Chicken Soup-y type aphorisms and daily meditations. Perhaps it is accentuated by the cliché art and bad fonts which typically accompany such things. Don’t get me wrong. I love sunsets. In fact, I would be thrilled to be present for the moment depicted above. But what’s great about the setting sun over the lake is definitely not the cloying overscript on a two-dimensional reproduction. A brief discussion of gratitude in a sans serif style. 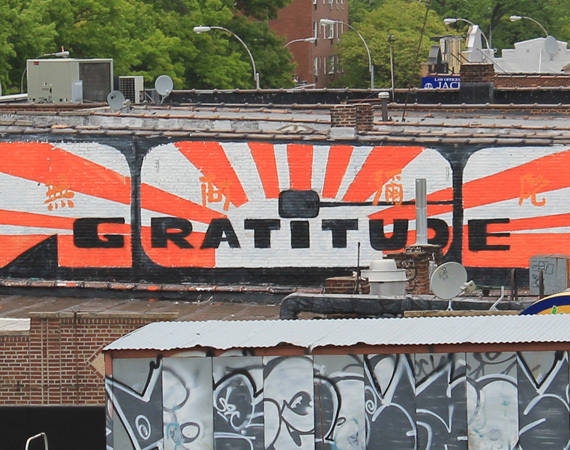 A memorial billboard for Adam Yauch, aka MCA from http://www.freshnessmag.com. Semi-recent articles in the Wall Street Journal, Huffington Post, the Atlantic Monthly, and Family Circle once again outline that teaching gratitude to your kids is important. Do it. Model gratitude. Big surprise. Thank your kids. Thank your significant other. Thank friends, cashiers, relatives, teachers, baristas, maybe even the DMV clerk. After all, it must be a sucky job. Give positive reinforcement. Even just “hey, thanks for noticing.” or “I appreciate your comment,” can help the set a pattern of behavior. Give them less. Have kids work toward something they want, do chores, earn money. Let them know the value of an item. I could buy you those shoes, but then we can’t order pizza tonight. Lost a backpack? Help earn a new one. Talk about how work hours translate into garbage pick up, electricity, gasoline, vacation. Read aloud Farmer Boy, by Laura Ingalls Wilder. In addition to being a humorous and vivid story, it discusses hard work, chores, about wasting nothing. There is also a great discussion about the value of a silver dollar that Almanzo would like to spend at the fair. Another book recommendation: Laura Ingalls Wilder’s The Long Winter. If that doesn’t make you appreciate having heat and food on the table, I don’t know what will. Amazing. Volunteer as a family. We’ve started very small. We collect our change and bring it to CoinStar periodically, which allows us to select a charity and send it electronically. What could be simpler? It teaches them that even pennies and nickels can add up to something significant. We’ve also baked cookies and given them out to homeless people, sold cupcakes to raise money for charities, and currently we foster kittens for the SPCA. Coach when appropriate. I often have my kids make their own purchases, even when they are using my money. I remind them to say thank you (before or after the transaction, not during. I try to avoid barking at them while they are mid-transaction) and ask them to leave a tip when appropriate. They need little nudges along the way. “I was disappointed that you didn’t seem more grateful after I helped you with your homework. I could have been doing other things.” Reminding them of opportunities to be aware and thankful is not cheating. Structure a moment of gratitude into the day. Practice, practice, practice! 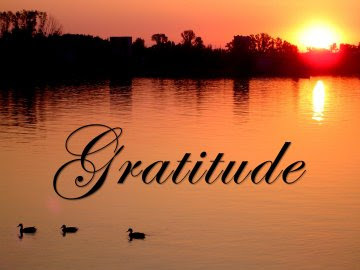 Gratitude is a muscle that needs exercising. Examining life for the positive helps lay new pathways in the brain, creating a positive mindset. That explains why Jeffrey Froh’s experiment had such an impact. This is big! I grew up saying grace at the table, so it feels natural to ask my kids, “What are you thankful about today?” when we sit down to eat dinner. I answer the question, too. I highly recommend Shawn Achor’s TED talk on Happiness. Don’t be put off by its title: “The Happy Secret to Better Work.” It actually includes the happy secret to better life. There are amazing nuggets tucked in amongst some amusing anecdotes. Among them: “90% of your longterm happiness is predicted not by the external world, but by the way your brain processes the world.” In other words, by your MINDSET. Further study has shown that increasing positivity increases creativity, energy, and intelligence, because the dopamine released not only makes us feel happiness, it turns on the learning centers of our brains. In the last two minutes of his talk, he outlines five quick and easy ways to increase happiness–based on research and not hopeful speculation. Guess what comes in at number one? Write down three new gratitudes each day for 21 days in a row. That is why I now have a gratitude journal, though I can’t call it that, of course. The phrase “Gratitude Journal” makes me gag a little. I have a crass name for it which I can’t repeat here, but which makes me laugh every time I take it out. I figure that makes me happier, too. Previous Previous post: Lobestir Special Guest Edition: Clark B.